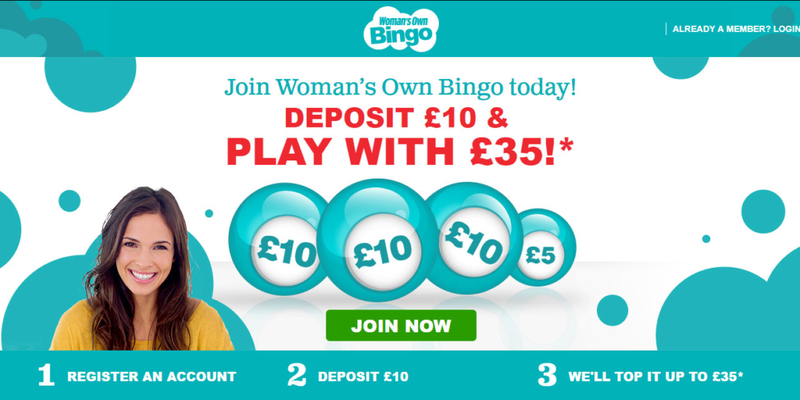 Woman’s Own Bingo is one of the UK’s best online bingo sites. It has a huge range of slots, casino games and online bingo rooms, plus a very friendly online community. The site got a much needed inform in July 2017 and feels like a brand new experience when you land on it. Inside while you will still find all your old favorites in both bingo and slots. All this is powered by Gamesys software and on the Jackpotjoy network. This means you will find games that are only available at a limited number of sites, both bingo and slots, plus some of the bigger name slot games you will be familiar with and this means you get the best of both worlds. 250% welcome bonus, a £10 deposit turns into £35 to play. With games starting at just 1p that’s up to 3,500 chances to win big! The maximum bonus available under this offer is £250 – available up to a maximum deposit of £100. There is something attractive going on almost every day at Woman’s Own Bingo. Be sure to check out the promotions page every day and don’t miss out. It is necessary to ‘opt in’ to many of the offers that involve spending on specific games or undertaking specific tasks. Playoff Palace – All bingo winners in the Sapphire room get free tickets to the big daily and weekly bingo game in the Playoff Palace. All winners of one line, two lines or a full house on most games before 7.55pm each day will automatically win 6 tickets for the daily game at 8.45pm and 6 tickets for the weekly game the following Sunday at 9.15pm. Super Links – Play for over £20,000 in guaranteed prize money every day between 8am and 12.30am in the Cloud, Emerald, Tiki, Sapphire, Diamond and Bejeweled Bingo rooms in these Super Links games. Each of these special games that play every 30 minutes is worth a guaranteed full house prize of between £250 and £2,000. Facebook: There are links on site to Facebook, but you will be taken to the Jackpotjoy page and not a dedicated Woman’s Own Bingo page. However, that being said it is still worth a visit as there are always lots of fun and games and chances to earn Joy Points and bonuses. Twitter: The Twitter account that the site links to is also that of Jackpotjoy. Woman’s Own Bingo can also be accessed via mobile, offering all be best bingo games and an excellent range of slots including Double Bubble, Zuma Slots, Diamond Bonanza and Zen Garden. There is also an excellent selection of live and classic casino games. All the games are fully optimised for mobile play. Players can either log into the site via mobile browser on mobile phone or tablet device, or download the App for iPhone or iPad, which makes it even easier to log in and play anytime, anywhere. As of July 2017 there is also an android app. The layout of the mobile version of the site is not complicated, nearly everything is accessible though the main page, such as – offers, bingo games, slot and casino games. You will find Sapphire Bingo, Lounge, Tiki, Emerald, Round the Clock and Session Bingo – basically the most popular rooms. The menu is located in a drop down at the top left of the screen and contents all the other sections of the site, such as My Account and Promotions. Overall the site runs well on mobile, it loads really quickly. The only issue with the newer version available in July 2017 is that the numbers are marked on your cards fractionally before they are called and shown in the game, so removing some of the anticipation which is a big part of any bingo game. iOS App Store – There is an iOS app to download. It’s layout and experience is identical to its mobile browser version. Android – As you log in via your android device you will be offered the alternative to download an app to your phone.